This extremely detailed two volume set gives an overall statistical summary of 8th Air Force fighter operations during World War II. Covering the period of September 1942 through the end of the war in May 1945, the story of the 8th's fighters is presented in an easy to read format. Each volume also contains over 170 photographs of the pilots and their aircraft. 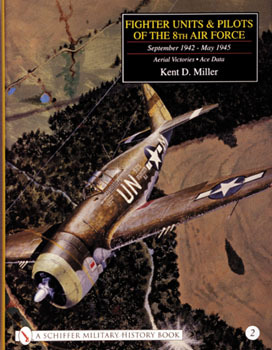 Over the years, many books have been written about the 8th Air Force, but none have combined all the details that appear in these volumes - volume one combines the 8th Air Force's day-to-day operations with individual unit histories; volume two lists all scores and ace details. Kent Miller's books are an invaluable aid to the researcher and historian.